Every year, Google introduces interesting new products and services. Inevitably people will use some of those products. will add value to their current offerings, and they are correct. Inevitably some of these products will become beloved by many, many people. Then one day google announces that the service you know and love is going away. but without fail it is never quite the same. (unless google kills the products that I am using to create this site). When Google Health was launched, the goal was to create a service that would give people access to their personal health and wellness information. Sadly Google Health did not get the traction that Google wanted for it. So as they killed it. On April 30, 2007, Google introduced iGoogle to the world. It was the new name for the Google Personalized Homepage (which was originally launched in 2005), and it was awesome. You could personalize it with apps, pictures and all sorts of wonderful content. You could even create your own gadgets to do special things on it. It was simple, but powerful. On November 1, 2013, iGoogle was be "retired" (with a pension I hope). 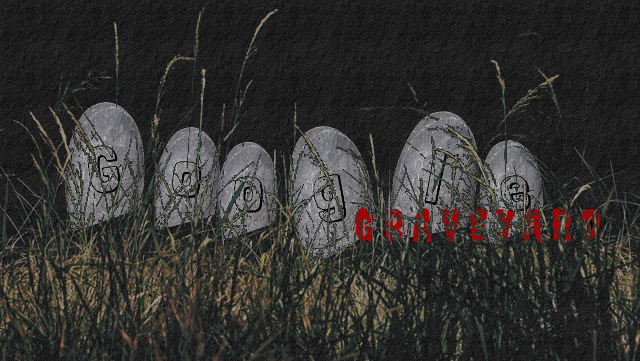 The Google Graveyard: Where google products go to die. It's a story that's all too common. Google releases this cool new feature. You start using it and you kind of like it. The more you use it, the more you like it, and you think to yourself, man if they just refine this a little bit it will be so incredible. Then one day out of nowhere, it's gone. Google has killed your beloved friend. It wasn't perfect but you miss it. Our goal it to help you in your process of mourning. Letting you know that you are not alone. We miss it too. Sharing a brief life sketch of the product (sometimes just talking about it helps). And when you're ready, we want to help you find a friend that can take the place of the one you lost.